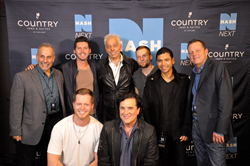 “Great showmen, very cohesive sound and a polished performance” were a few of the phases used by the NASH Next 2017 judges to describe Radio Romance, who will receive national radio airplay on Cumulus Media radio stations, and a recording contract under the Big Machine Label Group umbrella. “We woke up this morning and we didn’t have a record label or a booking agency," said Sam Hayes of Radio Romance. “But we are going to bed tonight with a record deal." NASHVILLE, TN, November 1, 2017 – Cumulus Media, #1 for country and radio’s dominant source for country music, announced tonight RADIO ROMANCE from Hermitage, TN as the NASH Next 2017 Challenge artist development competition grand prize winner. The final competition event took place at the Wildhorse Saloon in Nashville with live performances from the Top 10 national finalists and a special performance from 2016 NASH Next winner Todd O’Neill and The Valory Music Co’s Delta Rae. The finale showcased up-and-coming country talent discovered through this first-of-it’s-kind national radio grassroots talent search and artist development program for country music, sponsored nationally by Country Inns & Suites By CarlsonSM. “Great showmen, very cohesive sound and a polished performance” were a few of the phases used by the NASH Next 2017 judges to describe Radio Romance, who will receive national radio airplay on Cumulus Media radio stations, and a recording contract under the Big Machine Label Group umbrella. As a surprise addition to the grand prize package, Country Inns & Suites presented Radio Romance with a gift of 10 free nights at any County Inns & Suites locations. In 2011, Sam Hayes (Lead Vocal/Acoustic Guitarist), Josh Gramling (Lead Guitar/Vocals) and Moises Padilla (Drummer/Vocals) met and not only hit it off in the writing room and studio, but also found themselves becoming close friends. They began playing shows together on the streets of Broadway in downtown Nashville, and one day decided if they were going to keep playing together they might as well pick a band name. RADIO ROMANCE was born and the guys have been writing, recording and touring ever since. The band’s traditional country sound, mixed with their 90’s pop/rock harmonies make for a dynamic live performance full of energy. The winner of the NASH Next 2017 Challenge was selected by a celebrity panel of some of the biggest names in country music, including Big Machine Label Group President/CEO Scott Borchetta, - the world’s No. 1 independent record label and home to superstar artists including Taylor Swift, Rascal Flatts, Reba McEntire, Florida Georgia Line, Thomas Rhett, Brantley Gilbert and more; Kix Brooks, half of Grammy-winning duo Brooks & Dunn, country music’s most successful duo of all time, and host of Westwood One's American Country Countdown; award-winning Songwriter Hall of Fame writer Desmond Child, chart-topping entertainer Brantley Gilbert, who judged from home via a live stream while he awaits the birth of his first child, and the Tennessean’s Cindy Watts. Cumulus’ NASH Next 2017 Challenge pays tribute to the great tradition of radio as a launch pad for our most beloved musical talent and celebrates country music, the most popular music genre in the United States with almost 100 million fans. While television boasts several talent competitions, NASH Next is the first contest of its kind to offer its winner the opportunity for coveted radio airplay, which is the most effective medium to cultivate an artist and propel a major music career. And with Cumulus’ country programming broadcasting on almost 85% of all country radio stations nationwide, that opportunity is huge and unprecedented. To sample RADIO ROMANCE’S music, as well as hear songs and watch music videos from all of the Top 10 finalists, please visit: http://nashnextpresents.com. The seven-month-long NASH Next 2017 Challenge national grassroots talent and artist development competition was announced in May by seven diamond award winner and reigning CMA Entertainer of the Year Garth Brooks. 79 NASH/Cumulus stations in 62 markets, including Dallas, New York, Atlanta, Detroit and Nashville, conducted local searches for emerging artists, with additional national participation made possible through Cumulus’ digital properties and syndicated country shows. Cumulus listeners and local music industry professionals first judged the emerging artists. Local artists entered the competition via the NASH Next 2017 Challenge website (http://nashnextpresents.com) and were judged on three challenges by local music industry professionals, as well as listeners in their communities. First asked to submit an original song, contestants then adapted a popular song with a new style. In September, NASH stations hosted local live events and virtual events featuring video performances of each contestant’s original song. The Top 10 national finalists were selected from the live video challenge and judged by top record executives and music industry professionals. The live finals event was held at the Wildhorse Saloon in Nashville on November 1, 2017, from 7-10pm, where the grand prize winner was selected by a celebrity panel of some of the biggest names in country music and a fan judge. In the last five years, country has supplanted pop as the #1 most popular music genre, with 100 million fans (MRI, Spring, 2017). This is due, in part, to the fact that country has been influenced by both pop and rock styles to gain mass appeal. Country Inns & Suites by Carlson, an upper midscale hotel brand that provides a modern homelike aesthetic and warm, welcoming service with over 470 locations across North America. A leader in the radio broadcasting industry, Cumulus Media combines high-quality local programming with iconic, nationally syndicated media, sports and entertainment brands to deliver premium content choices to the 245 million people reached each week through its 446 owned-and-operated stations broadcasting in 90 US media markets (including eight of the top 10), more than 8,000 broadcast radio stations affiliated with its Westwood One network and numerous digital channels. Together, the Cumulus/Westwood One platforms make Cumulus Media one of the few media companies that can provide advertisers with national reach and local impact. Cumulus/Westwood One is the exclusive radio broadcast partner to some of the largest brands in sports, entertainment, news, and talk, including the NFL, the NCAA, the Masters, the Olympics, the GRAMMYs, the Academy of Country Music Awards, the American Music Awards, the Billboard Music Awards, Westwood One News, and more. Additionally, it is the nation's leading provider of country music and lifestyle content through its NASH brand, which serves country fans nationwide through radio programming, exclusive digital content, and live events. For more information, visit http://www.cumulus.com.